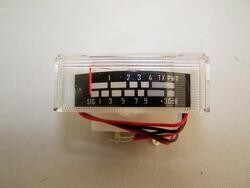 Replacement Meter that fits ALL Cobra 29/148/Uniden 66/68/Grant.. Meter has a Black Background with White Numbers. LED Bulb Included.